A colorful, fun-to-read introduction that explains the ways and whys of Hindu faith and worshipWhat You Will See Inside… A new series of illustrated books designed to show children ages 6 and up the Who, What, When, Where, Why, and How of traditional houses of worship, liturgical celebrations, and rituals of different world faiths, empowering young people to respect and understand their own religious traditions—and those of their friends and neighbors. Visual and vibrant, What You Will See Inside a Hindu Temple features many informative pictures and concise descriptions of what is happening, the objects used, the spiritual leaders and laypeople who have specific roles, and the spiritual intent of the believers. Ideal for children as well as teachers, parents, librarians, clergy and lay leaders who want to demystify the celebrations and ceremonies of Hinduism throughout the year, as well as encourage understanding and tolerance among different faith traditions. 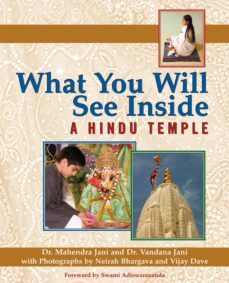 What You Will See Inside a Hindu Temple will: Satisfy kids’ curiosity about what goes on in a Hindu temple attended by their friends, broadening awareness of other faiths at an important age when opinions and prejudices can first form. Provide Hindu children with a deeper understanding of the practices of their own religious tradition. Give children the opportunity to ask questions, making them more active participants.